Set of quality 3-ply beverage napkins with your choice of napkin color, imprint color, typestyle, and positioning of personalization. 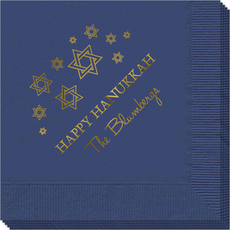 Napkins and imprint colors are are available in many sizes.Quality 3-ply napkins you'll be proud to use or give. Napkins are shrink wrapped in sets of 50. 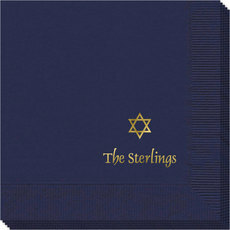 The Interlocking Star of David design will always appear on napkins.